As pet owners, we love our cats and will do anything to make sure that they're happy. But there are some occasions where we have to work late or become stuck in traffic. During these times we need an automatic pet feeder to help give them the proper nutrition. Your cats like routine. If they are used to having their dinner at a certain time, they'll become angry if you're late. Cats have a special way of informing you that they're unhappy! Fortunately, with a cat feeder, you can solve this problem. All you have to do is fill it up during the morning or the evening, and your cat will have their food within a respectable time frame. This guide will help you understand the underlying mechanics behind automatic cat feeders so you can care for your pet immediately and efficiently. What Is A Cat Feeder? Cat feeders are great tools to have when you are busy away from home and want to feed them. They are built with an additional timer and prevents your cat from making a mess when using the device. Having a cat feeder is a great way to properly feed your cat and give them food access during the right time of the day. While you can feed your cat personally through traditional methods, realize that you're wasting time. We recommend that you find a way to automate this task in order to make it easier for both you and your cat. And the best way to do so is to buy an automatic feeder. It works as an assistant to help users feed their pet cats. It works automatically and can be scheduled to give out treats; making it great for users who want their cats to be taken care of even when they're not around. There is a myriad of products that are found on today's market. 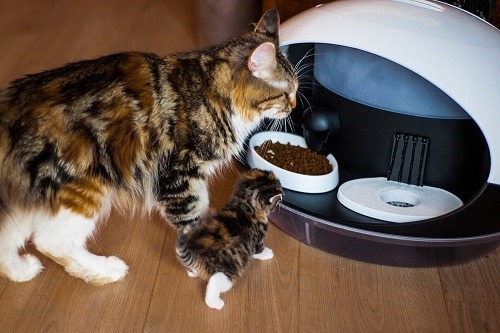 Some of them can be programmed and configured via your mobile phone.To help make the buying process easier, we've gathered some tips and information on how to find the right cat feeder tailored to your cat's needs. Dry cat food is consists of 8-10% of moisture. It's created by extrusion cooking that's made from high pressure and heat. Dry food is packed via multiple wall paper bags, some of them have a plastic wall layer; there are similar bag types with coextrusions or film laminates used to store the food. 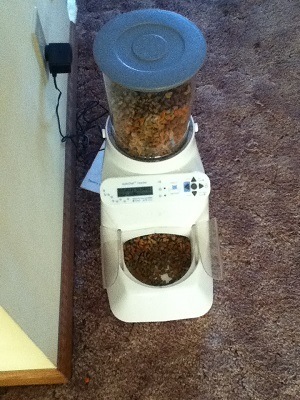 Automatic cat feeders are great for dry food. Since they have little to no moisture in them, you can easily place them inside of the container and dispense food properly. Simply place the dry cat food inside of the feeder, and you're good to go. In the US, wet or canned food has 75-78% moisture usually comes in steel or aluminum cans. They usually come in 3 oz, 5.5 oz, and 13 oz in size. Wet cat food is also sold in pouch form. Remember, moisture tends to spoil if left for too long. So you'll need to purchase extra ice packs so you can keep the food fresh and safe to eat. Alternatively, you can freeze the cans beforehand so you can easily place them inside the automatic cat feeder. When using a wet food dispenser, make sure you remove any excessive amount of water before placing it inside the machine. 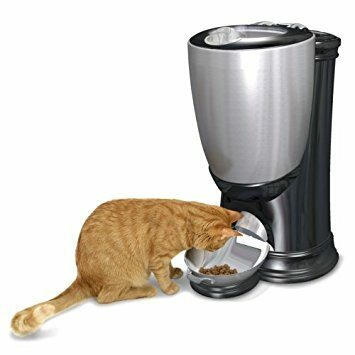 This prevents the food from accidentally getting caught onto your dispenser and makes it easier to feed your cat properly. For the most versatility, you should get a cat feeder that dispenses both dry and wet food. While they are more expensive, they give users the most options. However, cat feeders of this type tend to use the most power. Make sure you have an extra set of batteries before using this feeder to ensure that your cat can receive their favorite snacks when you're away at work. With this type, you'll want a device that brings your cat's food and water in a timely, yet efficient fashion. Some feeders have a feature that allows it to rotate between dispensing cat food and water. We suggest that you avoid cat feeders that have complex designs. Most of these feeders are difficult to clean up, making it harder to fulfill its main purpose; to feed and hydrate your cat. 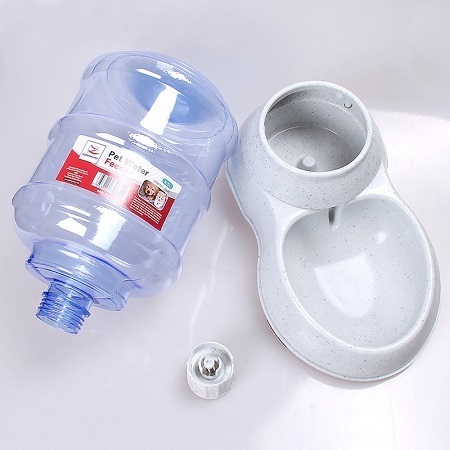 Get one with a simple design because it's easier for your cat to receive a sufficient amount of water each day. Before you waste your money on buying a feeder you don't need, make sure you understand the specs first. Knowing the specs helps you differentiate between good and bad feeders and helps you find one that's suitable for both you and your cat. You'll want to know if your feeder can take up wet or dry food first. To find out, take a quick look at your feeder and see which one it provides. 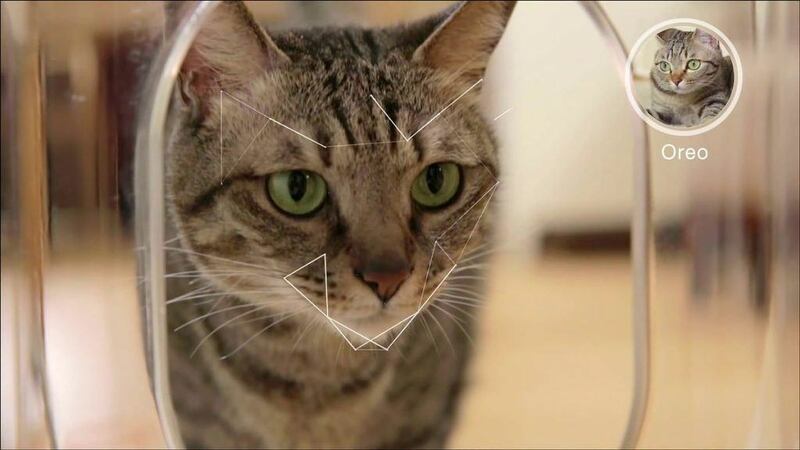 Doing this helps you see how the food feeder operates and see if it's a good choice for your cat. The capacity of your feeder is one of the biggest aspects to consider. If you plan on being away for long periods of time or you have a multitude of cats, you'll need a feeder that can hold at least 7-8 servings. Also, you'll have to decide how often you want the food to be dispensed. If you don't know how much food you should feed your cat, make sure to discuss buying an automatic feeder with a vet or follow your cat food's instructions. This ensures that your cat will receive the right amount of food they deserve. Some pet dispensers allow you to give your cat extra snacks in between meals. For most pets, this is a healthier alternative than eating just one large meal in a day. This is because your cat's body can digest food in small amounts easier than in large servings. We suggest that you find your cat's daily food habits before buying an automatic feeder. Some like to eat once a day while other cats like to have multiple meals throughout their daily routine. Most cat feeders have at least 7 feeding compartments. The more feeding compartments, the more meals the feeder can store. If you have more than one cat, we suggest that you get a feeder that's at least 10-12 feeding compartments to ensure each of them are properly fed. Plastic cat feeders are the most inexpensive option. They offer a quick way for first-time buyers to feed their cats and to see if automatic feeders are useful. We suggest that you only use plastic feeders temporarily as they can get into contact with germs easily. If possible, search for a cat feeder that's BPA free. This ensures that your plastic feeder can be easily used and enhances its lifespan. Plastics that aren't BPA free are more likely to expose your cat to acne. Thus, you need to be careful when choosing a plastic feeder. Ceramic cat bowls are an ok choice. But you'll want to look out for glazed products or products filled with glazed paint. If it's a glazed product without a "lead free" label on the packaging, then you should avoid it. You'll also want to look for ceramic pet bowls with a "Food Safe" label. This is because some ceramic styled cat feeders aren't food safe and might contain lead, or other toxic materials. All in all, use ceramic cat feeders with caution to ensure that your cat eats safely. Out of all of the materials, stainless steel is the safest choice. Plastic is considered dangerous to some owners as it's more likely to become exposed to dirt, dust, and other germs that might potentially harm your cat. Stainless steel is great for automatic cat feeders and water bowls. It's impermeable, is easily sterilized, doesn't react with other foods and liquids, and is safe to use. They are made of chromium, nickel, and molybdenum, which can accidentally reach the food if it's scratched, but only in a small amount. No matter what type of material you own, make sure that it's safe for your cat to use. 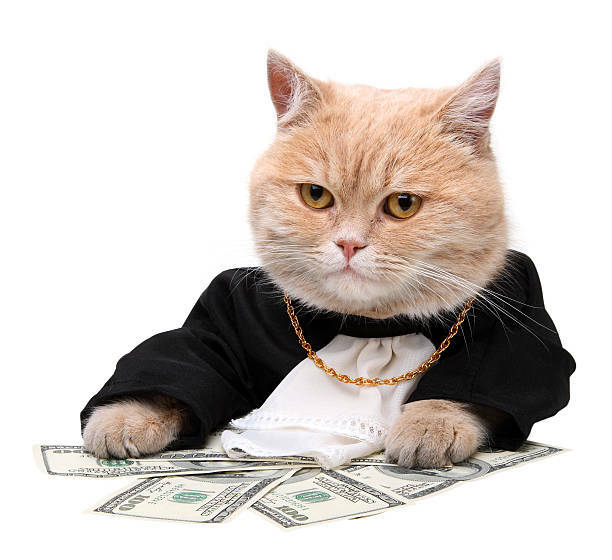 Many owners tend to waste money buying cat feeders that aren't healthy. As a rule of thumb, we recommend that you buy a stainless steel cat feeder as they are the easiest to use and manage. You'll also want to look into the power supply of your cat feeder. Each is operated differently, so you'll have to know which one works best with your cat and your household. Here are the two main types of power supply that the majority of cat feeders have. Most electrically powered cat feeders run on AC current. This is a recommended choice for you because it's more reliable than battery powered feeders. But, you'll have to check your feeder's wattage to ensure that your monthly utility bills remain low. The only disadvantage with electrical cat feeders is their lack of mobility. Unlike battery-powered feeders, you have to plug the automatic feeder into a stationary location. Otherwise, electric feeders are a perfect choice if you want a secure and stable device that will feed your pet at least 99% of the time. If you plan on buying a battery powered cat feeder, make sure that the batteries will last for a long time. Because if a power outage occurs, they become useless if the battery power is low. Use battery-powered cat feeders if you're traveling and want a quick way to feed your cat while you're gone. Basically, a cat feeder with dead batteries will cause your pet to starve in comparison to an electrically powered feeder that will still work during a power outage. Once the power is restored, the electrical feeder will continue to work normally. If you have extra money, you should opt for a feeder that has these features. Using a webcam is proven to prevent separation anxiety with your pet. You'll be able to care for your cat and interact with them while you're away. You should get a webcam that has a high viewing resolution. The higher the resolution, the less pixelated you'll appear and the better you'll appear to your cat. A high viewing resolution shows your pet in real time and gives you an extra feeling of security. Specifically, get a webcam that's at least 720p or 1080p so you can see your cat clearly. With voice recording, you can easily give you cat commands. You should use it to call for your cat and bring direct its attention towards the feeder. There are two types of voice recording options that you can use to speak to your cat while you're at work. One Way: One-way voice systems are for owners with older cats. This is because you'll be able to give your cat commands quickly. But, it has a disadvantage because you're unable to hear your cat's reactions. Get a one-way voice system if you're on a budget and want to speak to your pet without any interruptions. It doesn't matter what type of recording option you obtain. As long as your cat can hear you and acts accordingly when commanded, you'll gain a lot of utility out of your automatic feeder. Just because you bought the feeder, doesn't mean you can let it sit there. Germs, bacteria, and other viruses start to build up; resulting in the feeder malfunctioning or increasing the chance of your cat becoming sick. On average, you should thoroughly clean your feeder at least 2-3 times a week. This ensures that its free from germs and allows your cat to eat without experiencing any issue. Later on, we'll show you how to clean up your feeder to ensure that your cat without encountering harm. Cat Mate is a manufacturer that's owned by the even larger firm, Pet Mate. 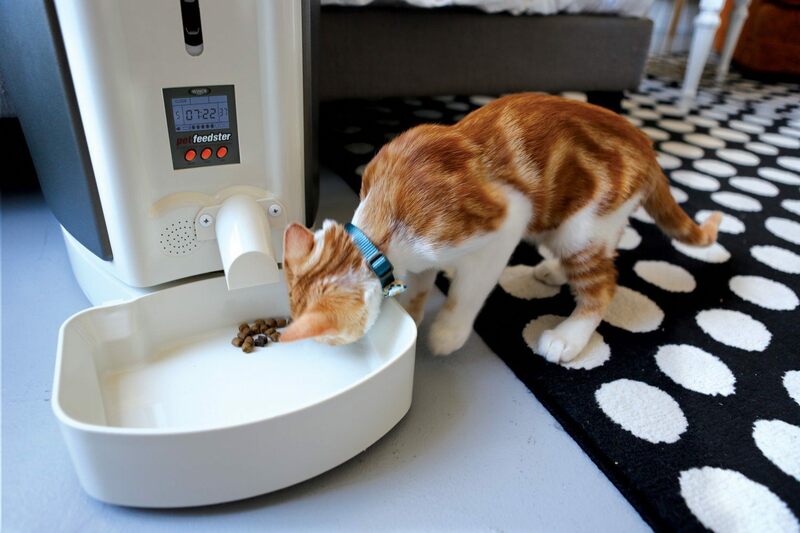 Cat Mate provides multiple products such as automatic cat food feeders, microchips, and pet fountains. Invest in one of Cat Mate's products if you want your cat to have a fully functional feeder. Since their origins in 1986, Cat Mate has gained a great reputation. Now, they sell their products across 40 different countries worldwide. Consumers love this company because their feeders are always up to par and offer a quick way to feed their pets no matter their location. Pet Safe is known for their advanced designs and innovative research in regards to the pet industry. Their main goal is to create innovative cat devices that for long-term happiness and safety instead of wasting their resources for a short-term profit. Plus, there are a lot of cat-related products that Pet Safe offers. For instance, they sell a bungee leash and a cat harness to keep your cat locked in one stationary position. Check out Pet Safe if you want your an affordable yet effective dispenser to feed your cat. If you're looking for a feeder that can feed your cat on a set schedule, you should look at Feed and Go. The company has a 52 cm x 41 cm feeder that allows users to add a 2 cups of cat food inside of it. You will also like Feed and Go due to their Wi-Fi connectivity. 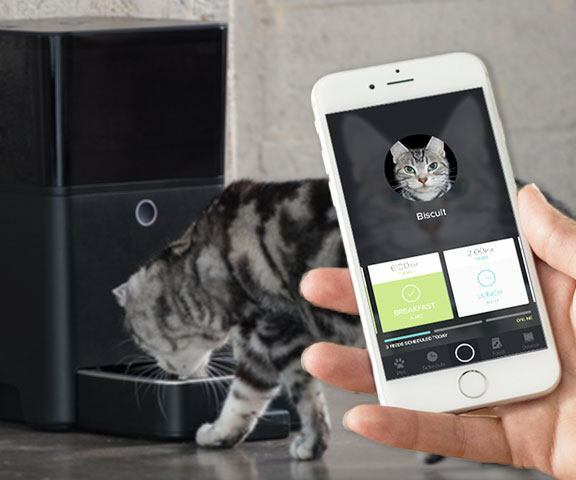 And it features a voice recording option which helps users communicates with their cats with ease. For cat aficionados who want an interactive feeder, they should try Feed and Go for the ultimate cat feeding experience. Pet Mate creates fun, quality, and trusted products that help enhance the lives of cats and their families. Each of their devices will help your cat receive their healthy daily dose of nutrition. In fact, most of their products and feeders come from the same factory where the first dog kennel was invented. Buy from this manufacturer if you want an energy efficient and functional cat feeder. Pet Mate buys recyclable, post-industrial, and pre-consumer materials to ensure that your cat can eat food naturally and safely. Thus, making it a good choice for eco-friendly pet owners who want a problem-free feeder for their cats. You have to read the instruction manual that your cat feeder provides. Some can be washed and dried by hand, while others will require some dry cleaning in order to work. Reading the manual helps users see how the machine operates so you can effectively utilize the feeder. You should only use cold water for cleaning. In addition, you'll have to use the permitted detergent to clean out your cat feeder. Mix both the detergent and water together and rub out the affected areas. Don't use hot water to clean the feeder. Never place your cat feeder inside the dishwasher. You'll run the risk of damaging the feeder's rotators and make it harder for you to clean it. Completely dry off the feeder before placing it back inside the machine. Cleaning your cat feeder is the best way to provide a safe meal for your pet. By following these steps, you prevent germ, dirt, and dust buildup from entering your feeder. If you can, clean out the feeder every time your cat eats from it to maximize its performance. There are a few pieces of information that you have to know before buying a cat cleaner. Using this information will make the buying process easier and enhance your cat's overall eating experience. When your cat is home, safety is a major concern. Make sure that your cat cannot injure themselves when using the cat feeder. We suggest that you place your feeder in an area where your cat can't accidentally unplug it. If your cat removes the feeder from the plug, it won't work if it's electrically powered. Some feeders are battery powered, but problems will arise if your cat knocks the batteries out of the machine. Test the feeder before you leave home to ensure that everything is working properly. Almost every automatic cat feeder is inexpensive. The feeder's size has an impact on the price, but the features dictate how much the feeder costs. Fancy models will that have web cams, bells and whistles will obviously cost more than a basic model. Also, the more components your feeder has, the higher chance of it causing problems later down the line. As we stated earlier, get a feeder that has 7-12 components to feed your cats without failure properly. Knowing about cat feeders is very important if you plan on taking care of your pet in the long term. They allow you to create schedules so you can plan out your cat's meals throughout the day. That's why you should invest in a cat feeder to care for your pet at all times. As we come to an end, you'll have to decide what cat feeder is valuable. There are a lot of feeders on the market, and it's up to you to decide which one will grant the most utility. 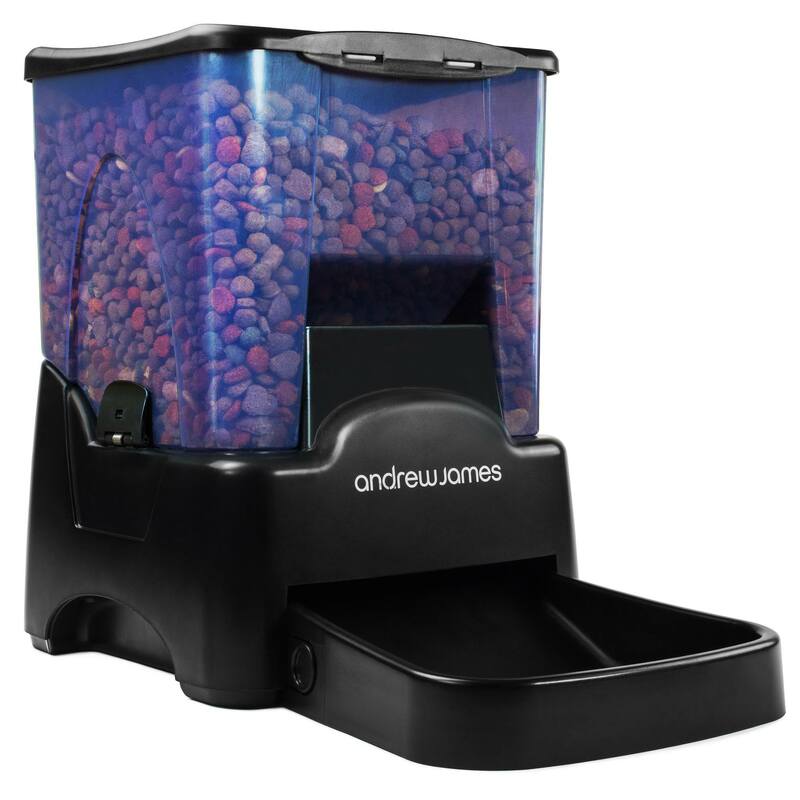 We invite you to read our buying guide so you can find the best feeder that your cat will enjoy.